Castor Oil is an anti-inflammatory and anti-oxidant oil which has been used for centuries for its therapeutic and medicinal benefits. It is rich in fatty acids and is soothing and lubricating. 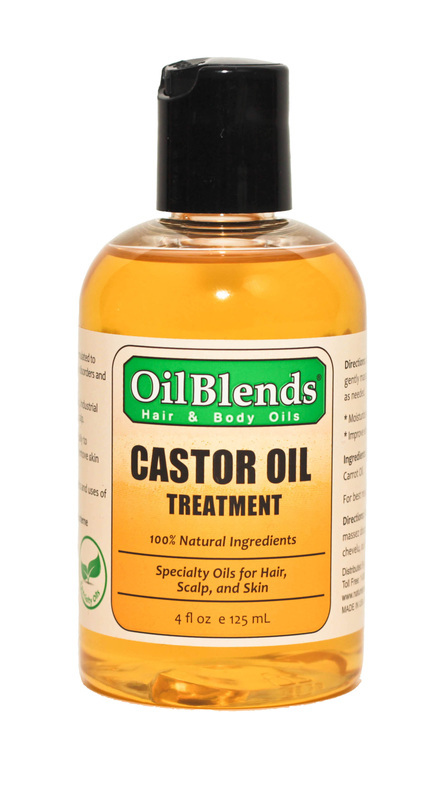 OilBlends Castor Oil Treatment, 100% pure – is a combination of powerful antioxidants and natural antiseptics that helps skin and hair tissue healing. Excellent for deep-down skin moisturizing and softening. Formulated with the best quality natural ingredients to control mild to moderate Skin Disorders, Inflammation, Psoriasis, Eczema, Dermatitis, Dry, Flaky or Itchy Skin. One of the best things you can do for healthy hair and scalp is to give your self a natural hot oil treatment, using OilBlends Castor Oil Treatment. Use as a conditioning treatment to help repair dry, brittle, damaged, and over-processed hair. Moisturizes and stop hair breakage. Helps control dry, flaky or itchy scalp. Excellent for receding or thinning hair, helps to treat hair loss. Use as a hot oil treatment to loosen the scalp and hair follicles – allowing trapped sebum and old hair to detach – freeing the scalp and follicles to benefit from scalp massage. Gently massage the scalp for increased blood circulation and stimulation of the hair follicles to accelerate healthy hair growth.